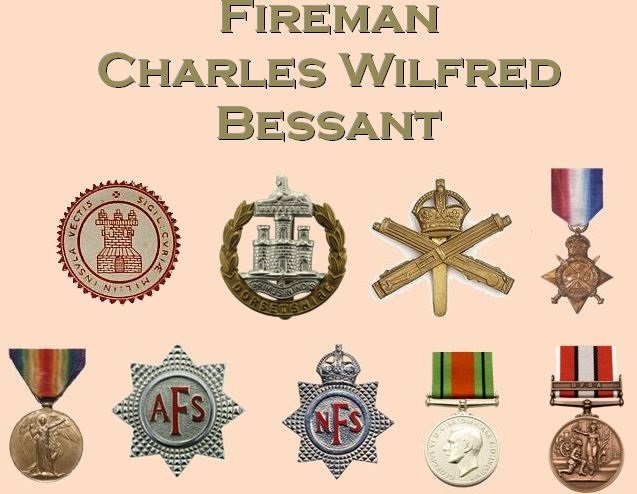 Fireman Charles Wilfred Bessant passed away on 5 December 1970 aged 72. Charles was born in Ryde on 23 May 1898. He had an elder sister Ellen and would have been the second-eldest son if his elder brother Frank had not died less than one year old in 1897. Another Frank followed Charles a year later. In all their parents, Frank and Ellen senior, produced nine children, two of whom didn't survive infancy. Frank senior worked as an auctioneers porter. Both Charles and his slighly younger brother Frank junior lied about their ages to serve during the First World War. Charles began service with the Dorset Regiment (Pte 203115) and later with the Machine Gun Corps as Private 143204. After the war in 1919 Charles returned home and married Ivy Harris but the army life suited him and he continued to serve for a substantial period of time between the wars. In 1923 they had a son Douglas. When the 1939 Register was taken in September of that year Charles, Ivy and Douglas were living at 10 Prince Street, Ryde. Charles was working as a general labourer and his son as an errand boy. Charles's younger brother Frank was by now a member of the local company of the Auxiliary Fire Service and Charles followed a year later; both continued to serve when the National Fire Service was formed. Again Charles's service extended beyond the war and he became a retained member of Ryde Fire Station when the Isle of Wight County Fire Brigade was formed in 1948. He remained in service until retiring in July 1953. Ivy passed away in 1969 and Charles, still residing at the same address in Prince Street, fell ill and passed away at St Mary's Hospital on the Saturday 5 December. Rest in peace Fireman Bessant.